They Both Tilt Their Heads Back. Seconds Later I Got Goosebumps! Howling doesn’t always come natural to a dog. Often we’ve seen the videos of a puppy learning to bark or howl along with another, older, dog. Heck, even wolves are good teachers for the howl, though they’re a bit more dangerous to let directly around your four legged friend. There is, however, an alternative teacher for the howl: US! Yes, dogs will copy anyone they can, and people can and have taught their dogs to learn how to howl. If you don’t believe it, just feast your eyes on the cutest instructional video you may ever see. 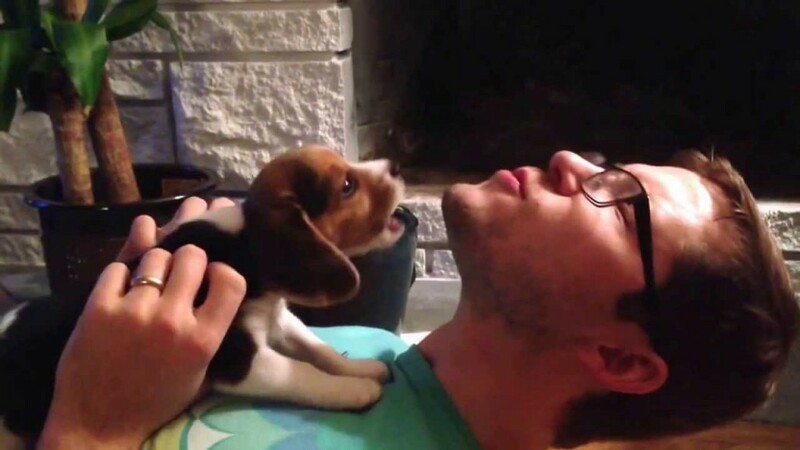 The little pup is a beagle, and they tend to do more of a howl than a bark. For some people, especially if your dog might have some kind of job working with you outside, a howl is much better than a bark. A howl can be heard from longer distances, and is easier for a person to find in the woods. So, when this little beagle pup watches his human lean his head back and start making noise, the only polite thing to do would be to then copy him, right? Well, copy him he does, and it’s about the most adorable little video you’ll see today. The puppy really starts to get into it at the end, putting a bit more volume and force into it. Cat Gets To Choose Between Two Boxes…Then It Becomes Hilarious!